TWO weeks after the release of 15 of the 21 detained Ife indigenes arrested as a result of the March 8 crisis in the ancient city of Ile -Ife, one of the detainees, Mrs Kuburat Eluwole was yesterday released from Police custody. However, five other detainees including Oba Ademola Ademiluyi have been moved to the Osun State Police command headquarters in Osogbo. A member of the defense team, Mr Muri Agboola, who was at the police headquarters in Osogbo yesterday, to see the detainees, was unable to see the state Police commissioner who was said to be at Ede town as at the time of the visit. Reacting to the development, the pan-Yoruba socio-political organisation, Afenifere, called for the unconditional release of the remaining detainees. 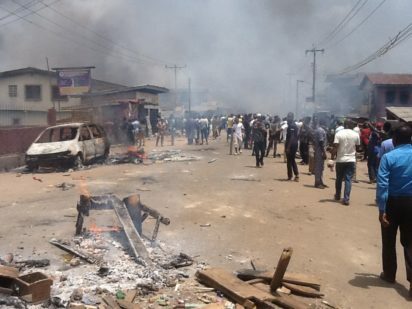 Recall that 38 people were arrested as a result of the Ife clash between the Yoruba and Hausa communities in ancient town but only 20 of them, including a traditional ruler, who were all Yoruba were paraded at Abuja Force Headquarters. Meantime, the sitting of the judicial panel of enquiry set up by Osun state government to look into the remote causes of disturbance of public peace at Sabo in Ile-Ife by Governor Rauf Aregbesola entered third the day yesterday. The chairman of the panel, Hon justice Adekunle Adeigbe while addressing the crowd before the panel began sitting said the extension date given to the complainants who were unable to submit their memoranda has elapsed. The panel received five additional memoranda since the beginning of the sitting bringing the total number of memoranda received so far to 145. Justice Adeigbe reiterated that Governor Aregbesola set up the panel to get to the root of the crisis in order to put an end to it and assured the complainants of fair hearing. The secretary of the panel Mr Bisi Babalola had earlier told the newsmen that Governor Aregbesola gave the panel four weeks to work on the memorandum as well as submit the recommendations which will based on the cause of the crisis. The post IFE clash: Female suspect released; monarch, 4 others moved to Osogbo appeared first on Vanguard News. The State of Osun should be applauded for not taking the Ile-Ife clash with levity. Weeks after the clash the judicial panel have still not swept the matter under the carpet. Hopefully very soon the perpetuators would be brought to book.